Driving over 100 mph, LA Councilman Wants Justin Bieber to be Arrested! Reports have emerged that Justin’s just got cited for speeding on the freeway. And the witness who called 911 just happens to be an L.A City Councilman told TMZ.com that Justin should have been handcuffed and arrested. Justin Bieber just got cited for speeding on the freeway, and the witness who called 911 — who happens to be an L.A. City Councilman — tells TMZ, Bieber should have been cuffed, locked up, and stripped of his driving privileges. L.A. City Councilman Dennis Zine — who ironically was an LAPD motor officer for 18 years — was on the 101 Freeway when he saw Justin in his chrome Fisker Karma roaring down the freeway at speeds that Zine says exceeded 100 mph. Zine tells us … Bieber was trying to shake a team of paparazzi (NOT TMZ) that was on his tail. Zine says, “If I was on patrol, I would have arrested him for reckless driving. I was going 60 and he drove by me like he was in a rocket ship. He was a maniac.” Zine called in to “TMZ Live” moments ago to explain exactly why he thinks Bieber belongs behind bars. Zine also says the paparazzi were incredibly irresponsible, driving on the shoulder of the freeway and causing an extreme hazard. 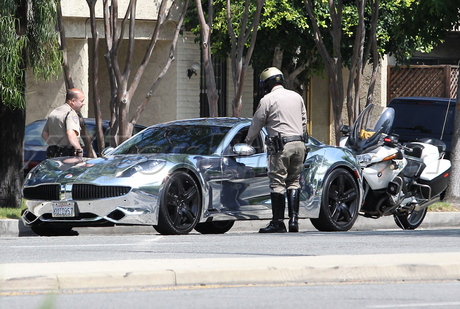 After he was pulled over, at least 4 paps were swarming Bieb’s car. Scooter Braun, tells TMZ, Zine “is just a councilman looking for a headline.” Braun says Justin was cited for going 80 mph and he was being chased by the paparazzi. Braun adds a short time after getting ticketed, the paparazzi resumed their pursuit and Justin called 911. Law enforcement sources tell us, after Bieber called 911, police caught up to his car and pulled him over again … along with the paparazzi following him. We’re told the cops warned the paparazzi to behave themselves, and everyone was sent on their way. Law enforcement sources tell us … the CHP is investigating the paparazzi for creating a hazardous situation. I bet he was driving away from the paps. They really need to hear the whole picture before they arrest him. i will stick up for him. I’m sorry but that line was hillarious! Follow me on twitter @jshabieber. I will follow u back. i disagree with some of you first its the law if you drive reckless you could hurt some one else yes the paparazzi was chasing him he always get chase by paparazzi a car is like a gun if you don’t know how to handle it you or some innocent by stander could get hurt and every body has to obey the law even justin bieber. This is freakin’ rediculous. You gotta speed up if the paparazzi’s are about to hit you.. justin dosent want his car hit. The freakin’ paps are drivng him crazy. First they wouldnt let him leave the parking lot while him and selena were leaving a theatre, now the paps are chasing him? they need to get a life. I am so sick and tired of the damn paps. They need to learn to give justin some privacy. I mean, really! anyone agree with me on this?? People need to leave him alone like u see he is pulled ovr andbu sworm his car and ask for an autograph ?!? Really? Put ur cameras away and give him some privacy ! Luv u justin BE CAREFUL! OKAY WHO GIVES A F*** ABOUT WHO IS FIRST OR SECOND! SERIOUSLY GROW UP! He got a ticket. I love Justin but this is one of those things where he was reckless and should have been more careful. He could of gotten hurt or hurt someone else. He really needs to be more consider it of others. Again no hate but he needs to be careful. JUSTTTIIINNN U SHOULD KNOW BETTER!!! He was being chased down by paps!! what do you expect him to do!?! him stop and let them jump all over them! They were f/cking following him. I mean, what the hell is that?! I know they were trying to make a quick buck but damn! Yea i agree he needs to be more people becuase he can be putting himself and others in harms way! He needs to be more careful on the road! Wow i jope he dont get aressted. He should be more careful! Hes been pulled over alot of times! Next time is probably a ticket or aressted. i agree with yah. The paps were the first one chasing justin and i do not at all blame him for speeding. They need to get a life. Justin shouldnt be arrested, its the paps fault!